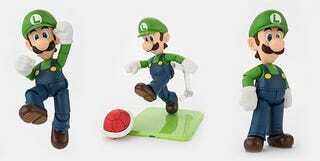 Following on from the release earlier this year of a killer Mario set, this SH Figuarts Luigi is looking just as good. He is not ridin' dirty. What he is doing, though, is jumping, posing and kickin' bad guys, since the figure's design allows for a massive range of movement. It's also great that it includes some diorama props, like a buzzy beetle, red pipe, red shell and some boxes and coins.